MEXICO CITY: A huge fire exploded at a pipeline leaking fuel in central Mexico on Friday, killing at least 20 people and badly burning 60 others as locals collected the spilling gasoline in buckets, officials said. Video footage showed dozens of residents near the town of Tlahuelilpan gathered to collect spilled fuel in buckets, garbage cans and other vessels. Fuel was seen spouting dozens of feet into the air from the tap. Footage then showed flames shooting high into the air against a night sky and the pipeline ablaze. Hidalgo Gov. Omar Fayad said 20 people were killed immediately and 60 suffered burns in the blast at the duct that carries fuel -apparently gasoline - from the Gulf coast to the Mexico City area. 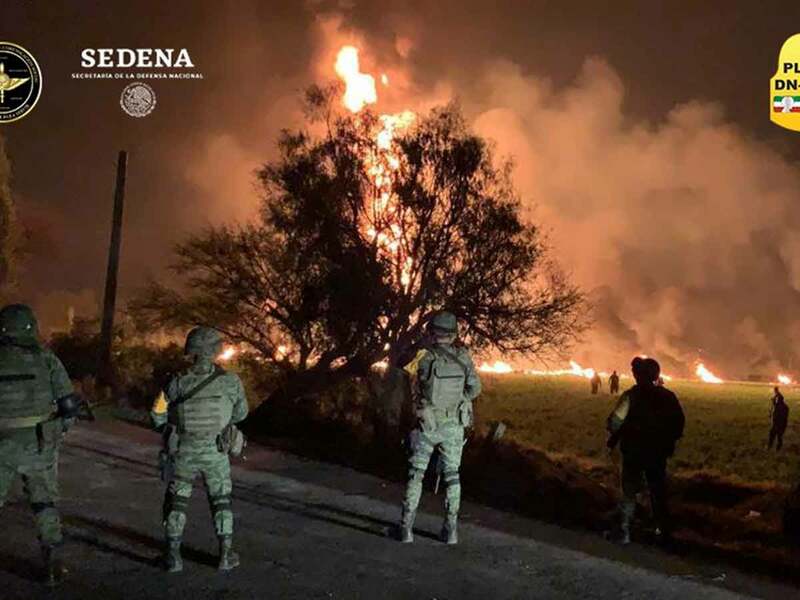 President Andres Manuel Lopez Obrador has declared an offensive against fuel theft, and on Friday he called on all branches of government to assist the victims. It is not the first time such an accident has occurred. Lopez Obrador launched an offensive against the $3 billion per-year fuel theft industry after taking office Dec. 1. Thieves drilled about 12,581 illegal taps in the first 10 months of 2018 and the country has deployed 3,200 marines to guard pipelines and refineries.